It didn’t take more than a few hours for Barack Obama to backtrack on the promise he made at last week’s AIPAC convention to maintain Jerusalem as the undivided capital of the Jewish state. But who are we to complain when Israel’s own prime minister chose to "celebrate" Yom Yerushalayim in Washington and was rumored to be carrying plans for the surrender of vast parts of the city, down to the last street name and alleyway? During Israel’s 60th anniversary celebrations Ehud Olmert admonished the Israelis to buy into his surrender and appeasement policy. To quell any ideas of retaining the Jewish capital, he declared: "Only fantasists can believe that in this day and age, and in the current situation, it is still possible to cling to the vision of Greater Israel." That Olmert had strayed so far from the Revisionist ideals of his ideological mentor Ze’ev Jabotinsky was bad enough. But this latest statement placed him even to the left of Ben-Gurion, who famously said, "To be a realist in the land of Israel, one has to believe in miracles." It was this fear of an imminent division of our national capital that brought such a large crowd to UK-Likud’s annual Yom Yerushalayim celebration in London the previous Sunday. In the front row I spotted Rev. Leslie Hardman. Now in his nineties, he was chaplain of the British armed forces in 1945 and one of the first Jews to unlock the horrors of the concentration camps. My own father at Auschwitz may have been one of those survivors who told his liberators how inmates had collected cigarette butts to trade tobacco with the camp guards in exchange for some flour to make matzo for Seder night. I fantasized a scene of the Jewish chaplain sitting among all those forlorn figures and what he might have offered them as some hope for the future. continued. "I have a vision that you will yet live to see the creation of a Jewish state in Eretz Yisrael with Jerusalem as its capital. And, after vanquishing all the Arab armies in six days, your children will begin celebrating their bar mitzvahs at the Kotel, where Jews from all over the word will come to pray under the protection of the strongest army in the entire region." Even with their wits dulled by starvation and disease, this group of survivors might have regarded the reverend as completely mad. 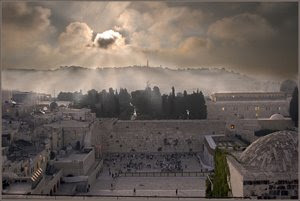 Nevertheless, stay with me and imagine if he had then continued to prophesy: "And then, having kept Jerusalem united under Jewish rule for 40 years, the new State of Israel will be asked by the world to give it back to the Arabs. And they will do so, with the stroke of a pen and not so much as a shot fired." I wondered at the level of anger and sense of betrayal such a conversation might have invoked among those Holocaust survivors. Those who have survived to this day will be no less angry, perhaps more so for the memories of their fellow inmates who perished in the camps with "Shema Yisrael" on their lips and a vision of Jerusalem in their minds. And yet, the prime minister of Israel will not even dignify their memory by putting up a fight for something millions died for. This appeasement of the world’s demands for the dismemberment of the Jewish state goes on against the backdrop of a new threat from Iran. At last week’s AIPAC conference, all the major speakers seem to have acknowledged that a nuclear Iran is not just Israel’s problem but represents a clear and present danger to the West as well. Just so, I would venture to suggest, is the proposed division of Jerusalem. The future of Jerusalem is not just a Jewish or Israeli problem. It is an issue that has major ramifications for the free nations of the West. We are in the midst of a world war commonly referred to as the "War on Terror." But when – and if – the history books are written about this struggle, it will be referred to by its real name: the Islamic War. A conflict between good and evil – between those who cherish life and those who embrace death; between those who seek to build on a century of democracy and technological progress and those who wish to bomb us all back into the Middle Ages. And the frontline of this essentially religious struggle is not in Iraq or Afghanistan, but in Jerusalem. To explain this I need to move from my fantasy about the chaplain in the concentration camp to science fiction, so much of which has ultimately come true. There is an old "Star Trek" episode in which the ship encounters a fiery ribbon cut into the blackness of space. All the instruments go off-scale and, in a flash, the captain and senior officers are beamed away and immediately replaced by doubles. But these doubles are brutal psychopaths; just the opposite of the decent men they replaced. Meanwhile, the real Captain Kirk and his officers find themselves on an identical ship, but one filled with consummately evil passengers and crew. They had interchanged with a parallel universe through a rip in the cosmos. A world where everything was the exact opposite – love supplanted by hate, compassion replaced by brutality. Dead bodies littered the lower decks as the degenerate crewmembers used murder to advance their rank. There is no better parallel to our present times. And no better manifestation of that rip in the cosmos than the Kotel Maaravi – the Western Wall of the ancient Jewish temple. In front of our Wall stands everything that is good. An impossibly tiny nation whose people count for one-tenth of one percent of the world’s population but hold the highest proportion of Nobel prizes in all fields of endeavor that have enriched the world and the welfare of mankind. The only nation in history to have returned to its homeland after 2,000 years – and, to top it off, in half a century transformed a desert landscape into a world-beating powerhouse. This side of the Wall swears in the recruits of the most humane army that has ever existed in the history of conflict – the only army that takes a human rights lawyer into battle against its enemies. Perhaps more important, this side of the Wall is home to citizens whose compassion and humanity are second to none in the world. A people who have not known a day free of terrorism in the 60 years since their state was formed and yet are daily healing the ailments of their enemies. And as Gazan children are treated in Israeli hospitals, their Jewish doctors live in fear of a phone call informing them that their home, or their children’s kindergarten, has been rocketed by Hamas. Despite all the lies and vile propaganda, it is a fact that Israel has never once cut off the electricity supply to Gaza. But still the Arabs continue to rocket the hand that feeds them and Ashkelon power workers come to work each day not knowing whether their homes will still be intact by evening. On our Jewish side of the Wall stands a people who can claim to be the most charitable on earth. Despite government cutbacks to maintain the essentials of defense and the huge cost of absorbing over a million new immigrants from Russia and Ethiopia, citizens have turned kindness into an art form. There are more charitable and voluntary support organizations per capita in Israel than anywhere else in the world. From simple soup kitchens to terror victim support, these organizations have woven a tapestry of humanity and compassion that would be the envy of the world – if only the world’s news media were honest in their coverage of Israel. As much as European politicians like to draw comparisons with Northern Ireland, most realists have come to accept that there can never be peace between Judaism and Islam. Irish Catholics may have wanted a united Ireland but they never incited their kids to kill every last Protestant as a religious duty. So long as Islamists use the Palestinian Arabs as pawns in their bid to remove all infidels from Muhammad’s peninsula, there will be no peace for Israel, no matter how much territory she hands over. Then we get to the parallel universe that stands on the opposite side of the Wall. A culture of hatred and death that starts in kindergarten. A faith that has translated its holiest book into a screed of savagery. A cowardly army that launches rockets from schoolyards and hospitals. Mothers who celebrate the suicide deaths of their bomber sons and who send their daughters on postnatal appointments to bomb the Israeli midwives who delivered their last grandchild. Unrepentant terrorists who vow to return to their murdering ways even as their freedom is negotiated in exchange for a simple set of Israeli dog tags. This may be the front line, but the demon seed has already pollinated in Europe and America. London and Madrid have had their own taste of 9/11 and there will surely be more to come. In just the past few days we have seen the architect of 9/11’s carnage using a U.S. courtroom to extol his pride in the Islamic mission of mass murder and thereby encourage other sleepers to follow his example. Whenever I stand at the Kotel, I feel very strongly that this wall represents the thin line between these parallel universes of our time. By the grace of God, Israel stands at that frontier and has provided free access to pilgrims of all religions to the places that are holy to their faiths. The free world remains that much safer for as long as Israel holds that line. 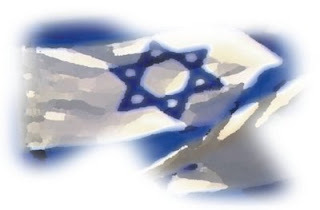 As for all the journalists and pundits who love to demonize the Jewish state at every opportunity, let them remember that they are only free to do so because countries like Israel keep that rip in the universe sealed up. If the forces of radical Islam are allowed to seep through and take hold, their critical reporting will be subject to beheadings and their womenfolk will no longer be free to dress, work, and live life as they please. When I stand at the Kotel I also focus on all those kvitlach; the hundreds of scribbled notes squashed into the cracks of the wall. Each one seeks help from the Almighty in some way or another: to cure a sick child, to find a suitable marriage partner or simply sufficient funds and food to keep the family going. But mostly, just a simple wish for "peace" – whatever that word means in the lexicon of this troubled region. I don’t know if there is a similar wall or "wish depository" in the parallel universe. But if there were such a thing on the opposite side of the Wall, I imagine the majority of entreaties from the radicalized masses could be summarized by one central theme: "Death to the Jews." So there it is: Jerusalem truly is the "Final Frontier." And I am thinking: what better way to seal those cracks and insulate us from such a parallel universe of hate than with the prayers and pleas of decent people who share and cherish our simple human values?